The Jack Douch Memorial Trophy for cricket in the community was won this year by Bere Regis Cricket Club, who also picked up £400. The trophy and cheque were provided by the league sponsors, The Dorset Funeral Plan, and the award is named after Jack Douch, a cricket enthusiast and war hero. From the age of 14 Jack worked for his father’s firm, F.C. Douch and Son in Wimborne, which now has nine funeral branches across Dorset. In 1999 they introduced The Dorset Funeral Plan, which has been sponsoring the cricket league for more than ten years. Jack’s family decided to mark his passing four years ago with the award for the club that has done most for the game in their community. The short-list this year consisted of Shroton CC, Shillingstone CC, Wimborne and Colehill CC and the eventual winners. 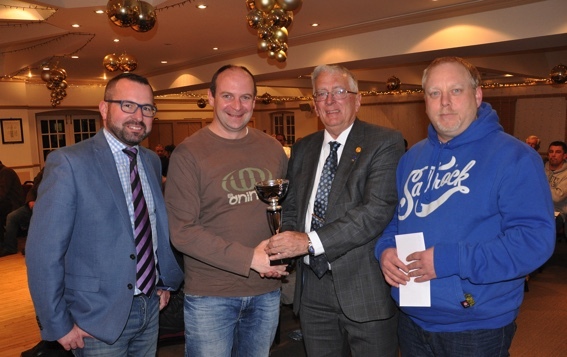 Bere Regis CC was awarded the trophy – in its fourth year – because it is a community-minded club. It has created a thriving youth section with 50 youngsters playing each week and the captain of the Under 15s sits on the committee. Dean Rogerson, vice chairman, picked up the award along with secretary Paul Smith, at the league’s AGM at the Crown Hotel in Blandford. He said: “Over the last six years we’ve really made an effort to grow the youth cricket. “We have three youth teams and the Under 15s are playing in an indoor league this winter. “We have two senior Saturday sides and an evening league team and it is a great honour to win this award – it came as a real surprise. League chairman John Ridout said: “We had a long discussion to decide who would win this year’s award. Peter Douch, Chairman of the Douch Family Funeral Directors which runs The Dorset Funeral Plan, presented the trophy.